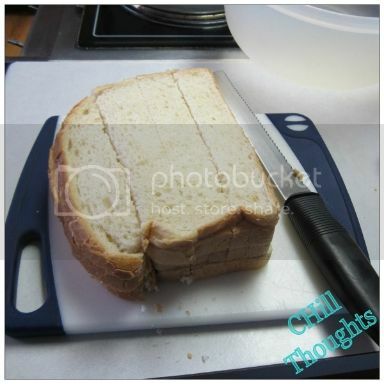 My name is Cristyl and I write over at Chill Thoughts. I haven’t been blogging very long; just a few months! I write about my life, my family and pretty much anything that comes to mind; I’m currently wallpapering my desk in post-it notes with ideas for my future posts! I’m excited to be chosen as a guest blogger at Fireflies and Jellybeans while Fawnda is out enjoying her precious new little one! Congratulations, Fawnda! 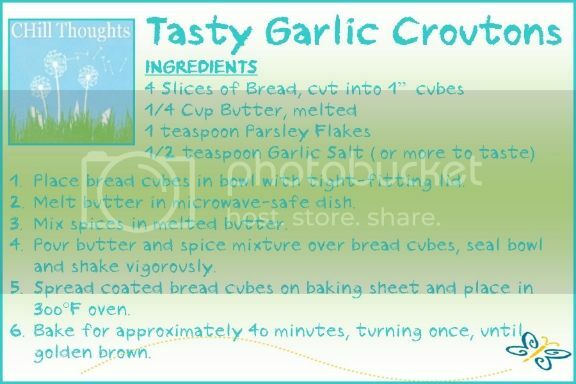 Today, I’m excited to share my Garlic Crouton Recipe with you! 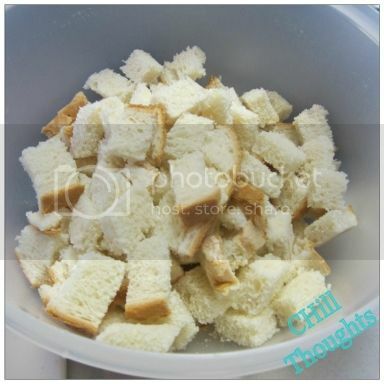 I use bread I have on hand to make my croutons. I’ve used cheap store brand wheat bread as well as sourdough bread. DH says he prefers the sourdough, so that’s what I used for my latest batch. 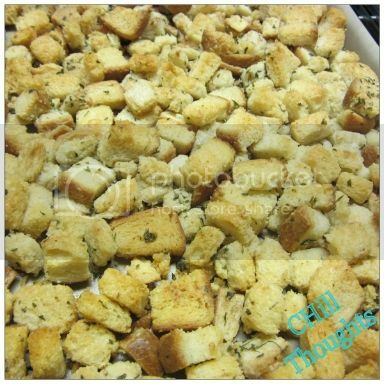 I use 4 slices of bread for a batch of croutons (in these photos I was making a double batch because we love these so much). I use four slices of bread per batch; cut the slices into 1” cubes (you don’t have to be precise – make the cubes whatever size you prefer). Place the cubed bread into a bowl with a tight-fitting lid. This recipe only requires three ingredients other than the bread; I told you it is super-easy! Melt a 1/4 cup of butter (half a stick) in a microwave-safe bowl. 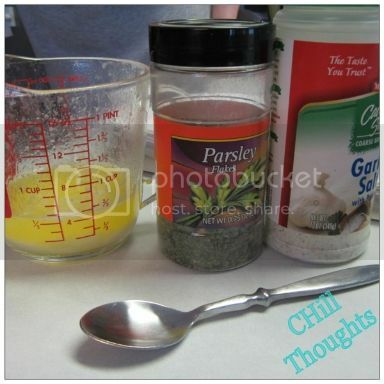 Mix 1 teaspoon of parsley flakes and 1/2 teaspoon of garlic salt into the melted butter. (I prefer super-garlicky croutons, so I usually use about twice as much garlic salt. Feel free to adjust to your preference.) Now pour the butter and spice mixture over the cubed bread, place the lid on your bowl and shake vigorously to coat all the cubes in the mixture. 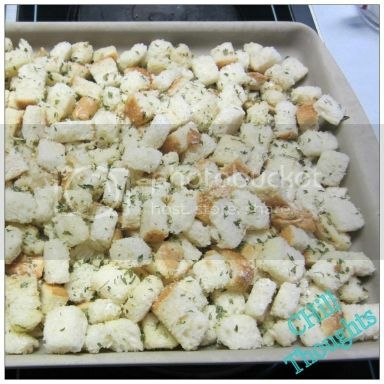 Spread the coated cubes on a baking sheet of your preference; I just love my Pampered Chef stoneware for making croutons (and just about anything else). Pop that into a pre-heated 300 F oven and set a timer for 20 minutes. After twenty minutes, turn the croutons and return them to the oven; set a timer for another twenty minutes. Bake the croutons until they begin to brown nicely (I prefer mine more crisp so I let them get very brown; feel free to adjust the cooking time to achieve the perfect crouton). That’s it! 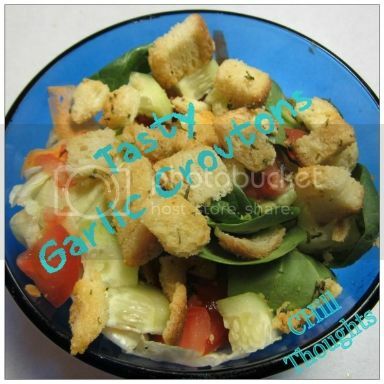 Super tasty, easy to make and much cheaper than most retail croutons! I hope you will stop by my blog to check out what’s going on; I plan to share more of my favorite recipes as well as sewing projects, craft projects and just daily life!